Governments and companies pushing for greater monitoring of Internet activity pose a major threat to freedom and democracy, according to Tim Berners-Lee, inventor of the World Wide Web. 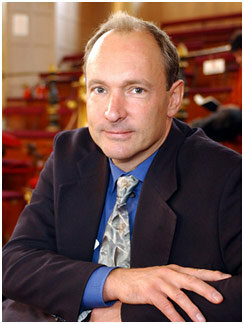 Tim Berners-Lee is a professor at the Massachusetts Institute of Technology (MIT) and the inventor of the World Wide Web. He was speaking to Gary Finnegan. You have campaigned hard in the US for 'net neutrality'. Why do you attach such importance to this issue? I see this as one of the biggest issues facing the future of the Web but the extent to which net neutrality is threatened differs from country to country. The fact that the Internet is a medium which does not discriminate on commercial grounds or party political grounds is taken for granted in a lot of cultures, but I've been shocked to find a sudden change because some company or some part of the government has decided to get control of it and use that control. I hope the industries involved will realise that net neutrality is very important for them. It's very important to have a neutral network which allows people to introduce new applications. It allows a fairer market. It allows somebody to set up a new independent film website and make their own movies and become an international artistic celebrity, without having to have been adopted by a huge multinational company. I think that's a very exciting prospect for the film industry and all the other industries. If you're an Internet provider is also a cable movie company, you don't want them to be able to make it difficult for you to communicate with an independent movie producer. But it's more than that. When you look at the ways net neutrality could be threatened, you have to think about how many decisions you make on the Web and what it would mean if somebody could affect those decisions. What if somebody could make it easier for you to get to a particular shoe store: it would be pretty powerful, commercially. Or if they could make it difficult for you to go to websites about evolution, then they can try to influence how you think – which is much more frightening. In a world where democracy is getting more participatory, it's very important that people are informed over a neutral medium so they can connect to whoever they want. Another issue that is very important is snooping. I don't want any snooping on my Internet traffic. You can do things to ensure that my Internet runs smoothly, but when I am doing something which is perhaps very intimate: when someone looks up something to see if they have cancer, or a teenager wonders if they are homosexual or not and wants to go online to find answers, this should be private. So systems that monitor every click and build a profile of me are very damaging. The things we do on the Internet are so intimate that they are much more valuable to others and damaging to me than having a permanent TV camera in my living room. I don't want my health premiums to go up if I look up health information; I don't want to be a suspected terrorist if I do research on chemicals, I don't want to get leaflets from gay rights groups if I look up something on sexuality. Yes, you need to be able to look inside the Internet to fight serious crime but authorities should be required to seek a warrant from an independent body first. How can the EU use the Internet to improve communication with citizens? One of the things I've been discussing with the UK government is openness with government data. And of course when you put something on the Web you have to do so with open standards. Please don't do it in a way that means everyone has to buy a particular system. Putting data on the web has lots of interesting results. One is that it opens up what is happening in the interest of transparency. Another is people can look at public services and see which schools are doing best, which country's trains run on time – and citizens can use that to apply pressure. The third thing is that by putting this data on the Web, that data is a very valuable asset. And the funny thing about data is that you never know how it is going to be used. People are sometimes amazed by what can be done when data is shared because you can combine data with something else. Data gathered for one particular reason about a school or an area or a transport network in one country can be correlated with other sets of data and this can produce interesting things – visualisations, tools that make it easier to be a citizen, things that help business. Government data is locked up. It has already been collected and paid for by the taxpayer so it should be opened up. But it's better if data is in a spreadsheet. PDF is okay because people have free viewers, but it's still just an image of a printed page. I'd encourage people to go for the spreadsheet rather than the PDF. What's your view on copyright issues on the web? How do you balance the free movement of information with the need to protect rights holders for music and video? My personal view is that I like music and art – I like musicians and artists and I think they should be rewarded. Content creators should have a way of making money so they can live. I don't think that this means very drastic technical means have to be used so I don't like digital rights management systems which encrypt the software. And I'm very happy with the tendency in the market to move away from things that I can't read, that I can't back up and use in the future. That saves a lot of hassle. It's important in this area to make it easy for people to do the right thing. You can't complain about people doing the wrong thing until you make it easy for people to do the right thing. There's a lot of work to be done to help users know who owns an image, for example. Sometimes it's a shock for teenagers to find they have to pay for music over the web but we should give them a one-click way of doing it. Micropayment systems could be useful for these kinds of things. I like the example set by Radiohead when they put their music on the web and made payment voluntary, and they got more money than they would have charged for it. Do you have a view on the Google Books case? There are two things here – one is about online books and the other is about Google. What most people are concerned about is the power of Google as a monopoly supplier of such services. It's the same fear I've heard voiced about Microsoft as a provider of software, and Netscape as the dominate provider of web browsers, and AT&T as the only phone service. In the same way, people worry about social networking sites becoming dominant. In each case when that happens, even though the company that initially seizes the monopoly does it through being innovative, the problem is that the only innovation that happens afterwards happens in that company's labs, even if they are very nice labs. The AT&T labs produced many things, like UNIX – accidentally, I suspect – but I think the telephone systems went through very little development at the time because there was a monopoly on telephones. So I think we have to worry when there are monopolies, but we also have to respect that when people do things well that they tend to get a large share of the market. Where do you stand on companies disconnecting Internet users who violate copyright law? This issue of snooping in general came up when the British parliament was discussing the case where a company called Phorm was doing some tests with British Telecom without asking anybody. They were snooping on what people were doing. There are various concerns about snooping on what people are doing so you see if they're doing anything illegal and then cut them off. One of the big problems is the snooping. You shouldn't be doing the snooping in the first place. If you think of how people on the borderline of criminality react to software which spots the sharing of illegal content, they will write software which looks as though it's doing something else – like a remote video session. Then you'll have to look very closely to find out whether this is a remote video session between someone in Europe and their partner who is fighting in the Middle East, or whether it's someone transferring a DVD piece by piece. You'd have to snoop so closely that you'd have to break the fundamental rights of people using the Internet. So if people running illegal streams will just encrypt the streams. And if you make running encrypted streams illegal it would be like storming in opening the doors. In terms of disconnecting the Internet, there are a lot of people who will scream very loudly that disconnecting the Internet is on a par with disconnecting water. Do you consider Internet access to be a fundamental right? There's a huge amount to be said in favour of making it a right. Yes, it's a right that comes after water but to disconnect a whole family would, I think, be what they call in the United States 'a cruel and unusual punishment' – which is unconstitutional in the US. When you make something a right, developed countries have a responsibility internally and externally to improve access. They have a moral obligation to act. In Europe, there would be huge benefits if everyone was online. Governments could serve all citizens entirely online instead of physically, making it more efficient and cheaper. What can be done to bridge the digital divide with developing countries? The future of connectivity depends on whether providers decided to provide a high-priced service to a small number of people or a lower-priced service to a large number of people. It also depends on how much local content is available – and by that I mean content in a local language, but also of local interest. The move to mobile technology is very important to developing countries. That's why it's so important to make web content accessible to people with phones. What is your position on censorship and Internet filters like the so-called 'Great Firewall of China', which Western companies helped to build? I understand that those countries were in a difficult negotiating position and I don't know all the issues involved. Clearly though, censorship is a bad thing. A country that can live without censorship is stronger than one that cannot. But I believe openness is something that is building, just as pressure mounted for the Berlin Wall to come down. I understand that the transition and opening up in some countries will take time but we should work on developing a timeline.